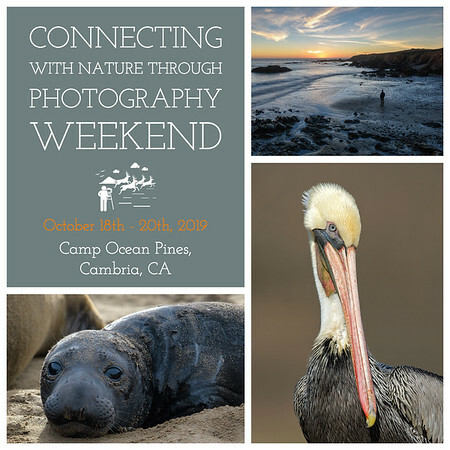 Join me for an inspirational weekend of photography amid a spectacular coastal setting! Explore how we can connect with nature, learn about our environment and make a difference through our experiences and the images we capture. Field activities visit nearby locations with specific goals in mind. We will take advantage of optimal light in the early morning and evening and when wildlife tends to be most active. Instruction and guidance will be provided in order to maximize the photographic opportunities we will be presented with. Classroom sessions include illustrated presentations and discussions evolve around our own unique moments and encounters in the wild. Sharing our work allows us to delve deeper into the thought process behind our photographs and the stories they tell. Although not required, I highly recommend staying on-site at Camp Ocean Pines to enhance the overall experience. It will be a wonderful way to stay connected with nature and your fellow participants throughout the entire weekend. All meals are included except dinner on Saturday night, which will be free for participants to visit and dine in the quaint town of Cambria. This workshop is open to anyone with a love of nature and photography. All levels are welcome: however, students must have a basic understanding of how to operate their own equipment. A minimum of 8 participants is needed to run the workshop. Registration and additional details are available on the Camp Ocean Pines website. I think it will be a wonderful experience for all involved. I hope you can join me! "I took an ‘Introduction to Wildlife Photography’ with Jacqueline at Filoli. She shared her valuable techniques, tips and professional knowledge of wildlife photography in down to earth simple terms and gave personal attention to each attendee. I am an amateur and I learned not only how to take better photos of wildlife but additional tips on how I may use my camera beyond the auto mode. Our field trip and the post processing lecture and critique was very informative. The whole experience was enjoyable and fun. I would not hesitate to take another workshop with Jacqueline, and hope to do so in the future." I am thrilled to once again join UnCruise Adventures as a guest host one of their photography themed cruises, where I will provide lectures and instruction throughout the entire voyage! This time around I will be visiting Mexico's stunning Sea of Cortez, which I visited for the first time 20 years ago as an employee of the former Cruise West. It is incredibly exciting to return this time around as a professional wildlife photographer where I can both utilize and pass on my years of knowledge and expertise. Jaques Cousteau, French marine biologist, called the Sea of Cortez “the world’s aquarium”. In 2005, the islands of the California Gulf were considered a Natural World Heritage Site by UNESCO. During our jam packed week, we will greet sea lions from the boat or skiff, or slip into a wetsuit for an even closer encounter. Relax with our toes in the sand, explore the desert landscape on a hike, or atop a mule through the canyons of Baja. Land and sea are a step, or kayak, away and there will be plenty of amazing photographic opportunities throughout! I hope you can join me! Please mention you were directed by Jacqueline Deely Photography. "Jacqueline was outstanding in her role as the professional photographer on our UnCruise trip in Alaska. Her knowledge of both the technical and the artistic aspects of photography was impressive! She did a great job of helping us one-on-one throughout the day and also in making evening presentations to the group. Her enthusiasm, her smile, and her outgoing personality make her a delight to interact with. We feel like we made a friend with her and have been in contact with Jacqueline to share more photography related information even after our trip was over." "I wanted to thank you so much for what you added to our Costa Rica and Panama cruise experience with UnCruise. You are truly talented as both an educator and an artist; those talents don’t often coincide. My daughter learned so much from you and you made her and all of our experience all the more interesting and enjoyable." 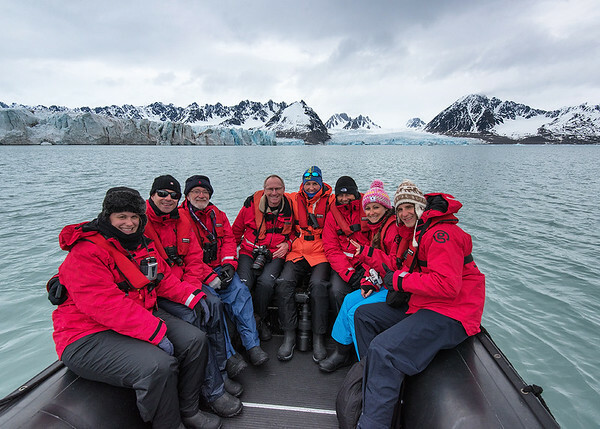 This is my fourth year with G Adventures as "Photographer in Residence", where I provide onboard lectures and guidance on select Arctic and Antarctic expedition tours. I also create a stunning end of journey slideshow which guests receive as a final memento. I have just returned from six weeks in Antarctica and will finish up this year by once again joining the expedition team on the final Arctic tour of the season beginning in Longyearbyen Svalbard, heading across to Greenland where we will spend several days exploring the stunning fjords along the east coast before heading south to Reykjavik, Iceland. Greenland has one of the most amazing landscapes I have ever seen and I can't wait to revisit this spectacular part of the planet. "My husband and I arrived for our three week trip on the M.S. Expedition with lots of camera equipment, but with no confidence in taking any sort of decent photos in the challenging light and moving subjects we knew we would experience on the trip. I had just about decided to give up on the equipment, sell it when we got home and buy an easy to use bridge camera in the hope of taking better photos! After two informative lectures with tips and advice from Jacqueline Deely, (resident photographer on our trip) we came home with fantastic photos and a renewed enthusiasm for photography. I had previously been on various photography courses in the hope of understanding how to use my camera to get the best results, but always came away confused and none the wiser! Jacqueline explained things in a simple, easy to understand way and I now understand the controls on my camera and am even converted to back button focus! I have been sorting through our photos and the difference between the first, none too successful photos we took at the very beginning of the trip and the ones we took after Jacqueline's lectures just cannot be compared for quality and composition. We both now have renewed enthusiasm for photography (instead of frustration) and are now going to invest in more equipment for our DSLR cameras! Thank you Jacqueline for totally changing our whole attitude to photography and helping us to produce such fantastic memories of our trip of a lifetime to the Falklands, South Georgia & Antarctica!" "I met Jackie on an expedition cruise to Norway and the Arctic Circle where she was the resident photographer. Jackie willingly shared her knowledge and expertise of photography both in a group setting and one-on-one as she shared her photos and camera settings while being challenged with the environment - 24 hours of daylight and attempting to shoot in a bobbing “zodiac” in the Arctic waters. Her suggestions and recommendations for photo composition, lighting and subject matter were spot on. Jackie is a fun and patient photographer that enjoys sharing her experiences." "Meeting Jackie on a polar expedition was a great experience. She has a warm and welcoming personality, which made it easy to approach her and ask her anything about photography. She always made time to sit down and explain in a way that anybody could understand. Her lectures were full of easy to understand tips and examples, yet she still managed to get deep into the more advanced functionality of photography, so even as a more experienced photographer, I still felt I left with newly acquired knowledge."